This article is part of a series of stories to mark World Food Day October 16. NAIROBI, Oct 12 2018 (IPS) - It was less than eight months ago that Mary Auma and her three children, from Ahero in Kenya’s Nyanza region, were living in a one-room house in an informal settlement. Ahero is largely agricultural and each day Auma would go and purchase large quantities of milk and resell it – earning only a 10 percent profit. 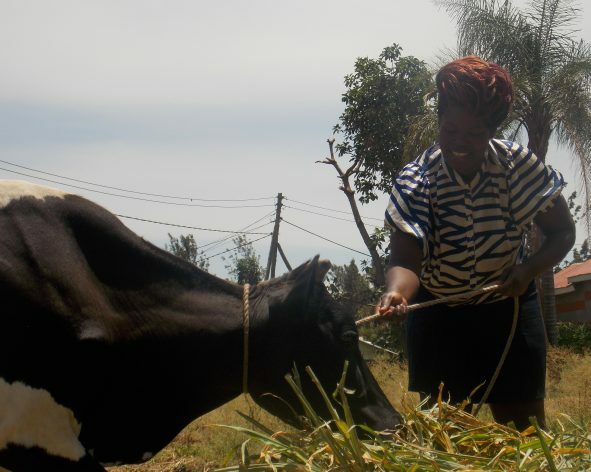 But in February life for the single mother and her children changed for the better when she raised the USD 1,500 required to purchase an acre of land and two cows. The money did not just buy her assets, but financial security and a sustainable income. And she has moved her kids to a nicer neighbourhood. “Eight years ago, none of us had land to call their own. Today, all 24 of us have been able to acquire land through loans received from the group’s savings." --Irene Tuwei, a member of the Chamgaa table banking group. This is all because two years ago Ahero joined a table banking group. Table banking is a group saving strategy in which members place their savings, loan repayments and other contributions. They can also borrow funds immediately. Table banking groups are growing in popularity across Africa, and can be found in Uganda, Tanzania, Malawi, Zambia, Mozambique, Niger, Nigeria and Sierra Leone. In some places they are called table banks and in others they are known as village banks. 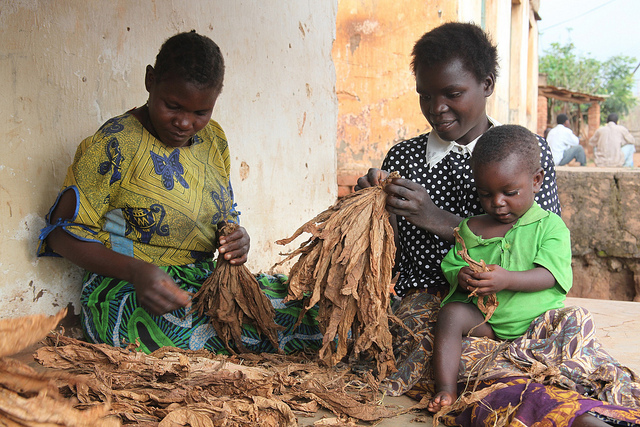 Auma always wanted to own land so she could become self-sufficient. “With a piece of land, I could live on it, keep cows, chicken and grow vegetables behind my kitchen. This is what I have always wanted but I had no money to start these projects,” she tells IPS. While women can freely own and buy land in Kenya, less than seven percent of them have title deeds, according to the non-governmental organisation Kenya Land Alliance. “You need collateral to secure a loan from a commercial bank and women generally do not have property. They are therefore unable to access credit to buy land. The concept of table banking is highly attractive to women because they loan each other the capital needed to acquire property,” Francis Kiragu, a lecturer at the University of Nairobi, tells IPS. Auma says that the loans from her table banking group are attractive since the only collateral women need to provide are household assets. “It is rare for members to default on loans as members are mainly neighbours and fellow church [goers] who come together in good faith,” she explains. 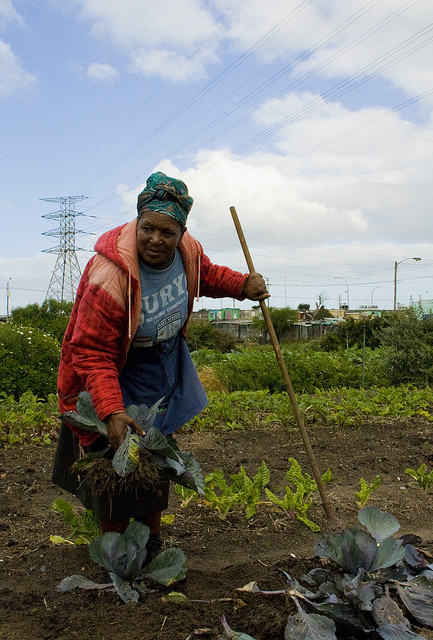 Farming on lands they do not own has made it difficult for women to make transformative decisions and to contribute to sustainable food security. But as informal banking takes on a new form among rural women in Africa, there is a chance that women will start having increased access to land. “Women are no longer hoarding pennies to share amongst themselves. We meet once a week and in just one sitting, 24 of us can now contribute up to 5,000 dollars,” Irene Tuwei, a member of the Chamgaa table banking group in Turbo, Rift Valley region, tells IPS. Tuwei says that unlike in the past, women do not have to wait months to receive their savings. Table banking is an improved version of traditional merry-go-rounds where women would save a little from their household budgets and the lump sum would be handed over to one person at a time. This would sometimes mean that if there were 15 members in a merry-go-round it could take 15 months for each member to have their turn in accessing the funds. Things have, however, evolved from this to a revolving fund. “In table banks, not a single coin is banked, which gives us instant loans without providing the kind of security banks ask for,” Tuwei says. One of the most visible table banking movements in Kenya is the Joyful Women Table Banking movement that has 200,000 members in all 47 counties, and which claims to have a revolving fund estimated at 27 million dollars. This is said to be currently in the hands and pockets of women across the country in form of loans. Tuwei’s Chamgaa group is one of 12,000 under this movement. “These groups are so successful that we now have banks reaching out to us offering special accounts where we can borrow money at very friendly terms. Before, these banks would never accept our loan applications because we did not have assets to attach while applying for them,” Tuwei tells IPS. Table banking is guided by rules and regulations designed and agreed upon by members. They include how often to meet, with some groups meeting weekly and others monthly. The rules also include loan repayment periods and also touch on how members should conduct themselves during meetings. Tuwei says that across table banking groups, small misdemeanours such as being late for a meeting can attract a fine of between USD 2 to USD 5. Loans given to members are also charged interest. “Eight years ago, none of us had land to call their own. Today, all 24 of us have been able to acquire land through loans received from the group’s savings,” Tuwei says of her group. Tuwei was struck by polio at an early age which affected her legs. So she could not move around freely and required assistance to plough her fields. Since joining the group, she owns three motorbike taxis, some cows, chickens, pigs and an ox plough. She also has plans to open a petrol station near a busy highway soon. She now also harvests approximately 80 bags of maize cobs, which translate to about 40 bags of grains once shelled. From this, she makes approximately USD 2,300 every harvest season and puts some of this money into her table banking group to boost her savings. “At the end of the year we share all the money that has been revolving among us for 12 months based on what each member has contributed, additional money gathered from penalties and interest from loans is shared equally,” says Tuwei. This year’s World Food Day comes on the heels of alarming reports that after a period of decline, world hunger is now on the rise, according to the Food and Agriculture Organization of the United Nations (FAO). According to FAO, while rural women are the mainstay of small-scale agriculture and contribute significantly to the farm labour force and to day-to-day family subsistence, they have great difficulty in accessing land and credit. Kiragu is emphatic that while the face of farming is still very much female, it will take more women accessing loans, land and information on better farming practices to end hunger, achieve food security as well as improved nutrition. “To begin with, the agricultural sector is not receiving sufficient financial support. In Kenya, only four percent of private sector credit is going to the agricultural sector,” Allan Moshi, a land policy expert on sub-Saharan Africa, tells IPS. According to FAO, women in forestry, fishing and agriculture receive a paltry seven percent of the total agricultural investment. Even more worrisome is that while women in Africa contribute 60 to 80 percent of food, only an estimated five percent of women have access to agricultural extension services. “Women understand land even better than men because they interact with the soil much more closely. We are now seeing more women taking charge of the land and not just as laborers, but also as land owners,” says Charles Kiprop, an agricultural extension officer in Turbo. He says that the number of women who own land as well as those who hire acres of land during the planting season is slowly on the rise. Kiprop tells IPS that women have also become more proactive in accessing key information on better farming practices. “I have been invited by women’s groups to speak to them on farming practices on many occasions. Women no longer wait and hope that we will pass by their farms, they are now coming to us either as land owners or those who have hired land,” he explains. Participation of women in harnessing food production cannot be overemphasised, particularly in light of the Global Report on Food Crises 2018, which says that the worst is yet to come. The report was co-sponsored by FAO, the World Food Programme (WFP) and the International Food Policy Research Institute (IFPRI). It predicted that dry weather conditions would aggravate food insecurity in a number of countries, including those in the horn of Africa’s pastoral areas in Somalia, parts of Ethiopia and Kenya. “The March-May rainy season in Kenya was below average, this has affected food production and spiked food prices,” Kiprop adds. According to the food security report, in the absence of conflict and displacement, climate change shocks were the main drivers of acute food insecurity in 23 out of the 65 countries and territories analysed in the previous 2017 on food crises. African countries were particularly affected. The report indicates that at least 10 percent of the population in Ethiopia, 25 percent in Kenya, 27 percent in Malawi and 42 percent in Zimbabwe are food insecure. Other affected African countries include Madagascar, Senegal, Lesotho, Swaziland and Djibouti. “Rural women will then be able to buy foods that they do not have therefore ensuring that their households are food secure,” he adds. He notes that the women will also be able to purchase farm inputs. Tuwei confirms that having an income has had a direct impact on her capacity to adhere to better farming practices. “Five years ago, I could not afford to hire an Ox plough and would rely on the goodwill of neighbours who would first plough their lands and then come to my rescue. Many times they would come when it was too late to plough and plant in time,” she explains. Tuwei further says that she and others in her group can now afford to use quality seeds, unlike before when they relied on seeds saved from previous harvests and those borrowed from neighbours. “With the right tools, women can overhaul the agricultural sector because they have always been the ones involved in the day to day farm activities,” says Kiragu. And thanks to the success of her milk business, Auma is ultimately glad that not only can she feed her children, but she can provide for their education and thereby their future also. the Food security begins at home, decentralized, with many small farmers, free of the constraints of global “market forces” which exist only to parasitize every system they can infect.